If Excel is installed on your computer, you can take advantage of the advanced charting capabilities in Word. Charts are used to display series of numeric data in a graphical format to make it easier to understand large quantities of data and the relationship between different series of data. Excel supports many types of charts to help you display data in ways that are meaningful to your audience. When you create a chart or change an existing chart, you can select from a variety of chart types (such as a column chart or a pie chart) and their subtypes (such as a stacked column chart or a pie in 3-D chart). You can also create a combination chart by using more than one chart type in your chart. Example of a combination chart that uses a column and line chart type. For more information about the chart types that you can select in Excel, see Available chart types. A chart has many elements. Some of these elements are displayed by default, others can be added as needed. You can change the display of the chart elements by moving them to other locations in the chart, resizing them, or by changing the format. You can also remove chart elements that you do not want to display. 1. The chart area of the chart. 2. The plot area of the chart. 3. The data points of the data series that are plotted in the chart. 4. The horizontal (category) and vertical (value) axis along which the data is plotted in the chart. 5. The legend of the chart. 6. A chart and axis title that you can use in the chart. 7. A data label that you can use to identify the details of a data point in a data series. After you create a chart, you can modify any one of its elements. For example, you might want to change the way that axes are displayed, add a chart title, move or hide the legend, or display additional chart elements. Change the display of chart axes You can specify the scale of axes and adjust the interval between the values or categories that are displayed. To make your chart easier to read, you can also add tick marks to an axis, and specify the interval at which they will appear. Add titles and data labels to a chart To help clarify the information that appears in your chart, you can add a chart title, axis titles, and data labels. Add a legend or data table You can show or hide a legend, change its location, or modify the legend entries. In some charts, you can also show a data table that displays the legend keys and the values that are presented in the chart. Apply special options for each chart type Special lines (such as high-low lines and trendlines), bars (such as up-down bars and error bars), data markers, and other options are available for different chart types. Instead of manually adding or changing chart elements or formatting the chart, you can quickly apply a predefined chart layout and chart style to your chart. Word provides a variety of useful predefined layouts and styles that you can select, but you can fine-tune a layout or style if it is needed by making manual changes to the layout and format of individual chart elements, such as the chart area, plot area, data series, or legend of the chart. When you apply a predefined chart layout, a specific set of chart elements (such as titles, a legend, a data table, or data labels) are displayed in a specific arrangement in your chart. You can select from a variety of layouts that are provided for each chart type. When you apply a predefined chart style, the chart is formatted based on the document theme that you have applied, so that your chart matches your organization's or your own theme colors (a set of colors), theme fonts (a set of heading and body text fonts), and theme effects (a set of lines and fill effects). You cannot create your own chart layouts or styles, but you can create chart templates that include the chart layout and formatting that you want. In addition to applying a predefined chart style, you can easily apply formatting to individual chart elements such as data markers, the chart area, the plot area, and the numbers and text in titles and labels to give your chart a custom, eye-catching look. You can apply specific shape styles and WordArt styles, and you can also format the shapes and text of chart elements manually. Fill chart elements You can use colors, textures, pictures, and gradient fills to help draw attention to specific chart elements. Change the outline of chart elements You can use colors, line styles, and line weights to emphasize chart elements. Add special effects to chart elements You can apply special effects, such as shadow, reflection, glow, soft edges, bevel, and 3-D rotation to chart element shapes, which gives your chart a finished look. Format text and numbers You can format text and numbers in titles, labels, and text boxes on a chart as you would text and numbers on a worksheet. To make text and numbers stand out, you can even apply WordArt styles. If you want to reuse a chart that you customized to meet your needs, you can save that chart as a chart template (*.crtx) in the chart templates folder. When you create a chart, you can then apply the chart template just as you would any other built-in chart type. In fact, chart templates are custom chart types — you can also use them to change the chart type of an existing chart. If you use a specific chart template frequently, you can save it as the default chart type. You can add a chart to your Word document in one of two ways: insert a chart by embedding it into your Word document, or paste an Excel chart into your Word document that is linked to data in an Office Excel 2007 worksheet. The main differences between embedded charts and linked charts are where the data is stored and how you update the data after you place it in the Word document. Note: Some chart types require a specific data arrangement in the Excel worksheet. For more information, see Arrange the Excel worksheet data. When you embed an Excel chart, information in the Word file doesn't change if you modify the source Excel file. Embedded objects become part of the Word file and, after they are inserted, they are no longer part of the source file. Because the information is totally contained in one Word document, embedding is useful when you don't want the information to reflect changes in the source file, or when you don't want the document recipients to be concerned with updating the linked information. In your Word document, click Insert > Chart. Enter your data into the spreadsheet that automatically opens with the chart. The chart will update to match the data after you finish typing data into one cell and move to the next. In Word, click where you want to insert the chart. In the Insert Chart dialog box, click a chart, and then click OK.
Office Excel 2007 opens in a separate window and displays sample data on a worksheet. In the Excel window, replace the sample data by clicking a cell on the worksheet and then typing the data that you want. Note: After you update the worksheet, the chart in Word will be updated automatically with the new data. In Excel, click the Microsoft Office Button , and then click Save As. In the Save As dialog box, in the Save in list, select the folder or drive that you want to save the worksheet to. To save the worksheet to a new folder, click Create New Folder . In the File name box, type a new name for the file. In Excel, click the Microsoft Office Button , and then click Close. You can create and copy a chart in an external Excel 2007 worksheet, and paste a linked version of the chart into your Word document. When a chart is linked, information can be updated if the external Excel worksheet is modified. Linked data is stored in the Excel worksheet. The Word document stores only the location of the source file, and it displays a representation of the linked data. Linking is also useful when you want to include information that is maintained independently, such as data collected by a different department, and when you need to keep that information up-to-date in a Word document. 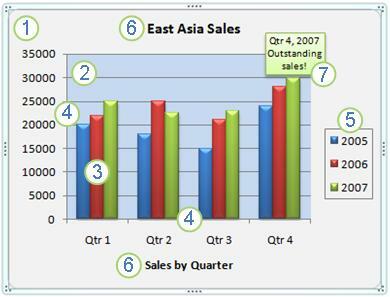 For more information about creating charts in Excel, see Create a chart. In Excel, select the chart by clicking its border, and then on the Home tab, in the Clipboard group, click Cut. The chart is removed, but the data remains in Excel. In Word, click where you want to insert the chart in the document. The Paste Options button indicates that the chart is linked to data in Excel. Save the Word document with the chart that you linked to data in Excel. When you reopen the Word document, click Yes to update the Excel data. You can also create visual representations of information by using SmartArt graphics. For more information, see Create a SmartArt graphic. On the worksheet, arrange the data that you want to plot in a chart. The data can be arranged in rows or columns — Excel automatically determines the best way to plot the data in the chart. Some chart types (such as pie and bubble charts) require a specific data arrangement as described in the following table. Select the cells that contain the data that you want to use for the chart. Tip: If you select only one cell, Excel automatically plots all cells that contain data that is adjacent to that cell into a chart. If the cells that you want to plot in a chart are not in a continuous range, you can select nonadjacent cells or ranges as long as the selection forms a rectangle. You can also hide the rows or columns that you do not want to plot in the chart. If the row or column contains data, CTRL+SHIFT+ARROW key selects the row or column to the last used cell. Pressing CTRL+SHIFT+ARROW key a second time selects the entire row or column. Click the chart type, and then click a chart subtype that you want to use. To see all available chart types, click a chart type, and then click All Chart Types or the More menu item to display the Insert Chart dialog box, click the arrows to scroll through all available chart types and chart subtypes, and then click the ones that you want to use. A ScreenTip displays the chart type name when you rest the mouse pointer over any chart type or chart subtype. For more information about the chart types that you can use, see Available chart types. Click the embedded chart to select it. This displays the Chart Tools tab. On the Design tab, in the Location group, click Move Chart. If you want to replace the suggested name for the chart, you can type a new name in the New sheet box. To quickly create a chart that is based on the default chart type, select the data that you want to use for the chart, and then press ALT+F1. When you press ALT+F1, the chart is displayed as an embedded chart. When you create a chart, Excel determines the orientation of the data series based on the nnumber of worksheet rows and columns that are included in the chart. After you create a chart, you can change the way that worksheet rows and columns are plotted in the chart by switching rows to columns or vice versa. If you no longer need a chart, you can delete it. Click the chart to select it, and then press DELETE. After you create a chart, you can instantly change its look. Instead of manually adding or changing chart elements or formatting the chart, you can quickly apply a predefined layout and style to your chart. Word provides a variety of useful predefined layouts and styles (or quick layouts and quick styles) that you can select from, but you can customize a layout or style as needed by manually changing the layout and format of individual chart elements. Click the chart that you want to format by using a predefined chart layout. This displays the Chart Tools tab, adding the Design and Format tabs. On the Design tab, in the Chart Layouts group, click Quick Layout, and then click the chart layout that you want to use. To see all available layouts, click More . On the Design tab, in the Chart Layouts group, click the chart layout that you want to use. Click the chart that you want to format by using a predefined chart style. To see all predefined chart styles, click More . Note: When the size of the Excel window is reduced, chart styles will be available in the Quick Styles gallery in the Chart Styles group. Click the chart or the chart element for which you want to change the style, or do the following to select a chart element from a list of chart elements. 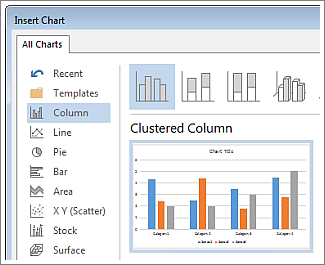 Click a chart to display the Chart Tools. To format any selected chart element, in the Current Selection group, click Format Selection, and then select the formatting options that you want. To format the shape of a selected chart element, in the Shape Styles group, click the style that you want, or click Shape Fill, Shape Outline, or Shape Effects, and then select the formatting options that you want. To format the text in a selected chart element by using WordArt, in the WordArt Styles group, click the style that you want, or click Text Fill, Text Outline, or Text Effects, and then select the formatting options that you want. Note: After you apply a WordArt style, you cannot remove the WordArt format. If you do not want the WordArt style that you applied, you can select another WordArt style, or you can click Undo on the Quick Access Toolbar to return to the previous text format. Tip: To use regular text formatting to format the text in chart elements, you can right-click or select the text, and then click the formatting options that you want on the Mini toolbar. You can also use the formatting buttons on the Ribbon (Home tab, Font group). To make a chart easier to understand, you can add titles, such as a chart title and axis titles. Axis titles are typically available for all axes that can be displayed in a chart, including depth (series) axes in 3-D charts. Some chart types (such as radar charts) have axes, but they cannot display axis titles. Chart types that do not have axes (such as pie and doughnut charts) cannot display axis titles either. You can also link chart and axis titles to corresponding text in worksheet cells by creating a reference to those cells. Linked titles are automatically updated in the chart when you change the corresponding text on the worksheet. To quickly identify a data series in a chart, you can add data labels to the data points of the chart. By default, the data labels are linked to values on the worksheet, and they update automatically when changes are made to these values. Click the chart to which you want to add a title, and then click the Chart Elements button. In the Chart Elements list that appears, select Chart Title. To insert a line break, click to place the pointer where you want to break the line, and then press ENTER. To format the text, select it, and then click the formatting options that you want on the Mini toolbar. Click the chart to which you want to add a title. Click the chart to which you want to add axis titles, and then click the Chart Elements button. In the Chart Elements list that appears, select Axis Titles. Select the axis titles that are added to your chart and type the text that you want. Click the chart to which you want to add axis titles. To add a title to primary vertical (value) axis, click Primary Vertical Axis Title, and then click the option that you want. Note: This option is only available when the selected chart is a true 3-D chart, such as a 3-D column chart. You can also use the formatting buttons on the Ribbon (Home tab, Font group). To format the whole title, you can right-click it, click Format Axis Title , and then select the formatting options that you want. Click the chart to which you want to add data labels, and then click the Chart Elements button. In the Chart Elements list that appears, select Data Labels. Select the data labels that are added to your chart and type the text that you want. Note: Depending on the chart type that you used, different data label options will be available. For more information about how to change data label entries or how to reposition data labels, see Add or remove data labels in a chart. To add a data label to all data points of all data series, click the chart area. To add a data label to all data points of a data series, click anywhere in the data series that you want to label. To add a data label to a single data point in a data series, click the data series that contains the data point that you want to label, and then click the data point that you want to label. On the Layout tab, in the Labels group, click Data Labels, and then click the display option that you want. When you create a chart, the legend appears, but you can hide the legend or change its location after you create the chart. Click the chart in which you want to show or hide the legend, and then click the Chart Elements button. In the Chart Elements list that appears, select or clear Legend. When a chart has a legend displayed, you can modify the individual legend entries. For more information, see Modify chart legend entries. Click the chart in which you want to show or hide a legend. On the Layout tab, in the Labels group, click Legend. To hide the legend, click None. To quickly remove a legend or a legend entry from a chart, you can select it, and then press DELETE. You can also right-click the legend or a legend entry, and then click Delete. To display a legend, click the display option that you want. Note: When you click one of the display options, the legend moves, and the plot area automatically adjusts to make room for it. If you move and size the legend by using the mouse, the plot area does not automatically adjust. For additional options, click More Legend Options, and then select the display option that you want. Tip: By default, a legend does not overlap the chart. If you have space constraints, you might be able to reduce the size of the chart by clearing the Show the legend without overlapping the chart check box. When you create a chart, primary axes are displayed for most chart types. You can turn them on or off as needed. When you add axes, you can specify the level of detail that you want the axes to display. A depth axis is displayed when you create a 3-D chart. To make a chart easier to read, you can display or hide the horizontal and vertical chart gridlines that extend from any horizontal and vertical axes across the plot area of the chart. Click the chart in which you want to display or hide axes or gridlines, and then click the Chart Elements button. In the Chart Elements list that appears, select or clear Axes or Gridlines. Click the chart for which you want to display or hide axes or gridlines. On the Layout tab, in the Axes group, click Axes or Gridlines, and then select the option you want. You can move a chart to any location on a document. You can also change the size of the chart for a better fit. To move a chart, drag it to the location that you want. Click the chart, and then drag the sizing handles to the size that you want. On the Format tab, in the Size group, enter the size in the Shape Height and Shape Width box. For more sizing options, on the Format tab, in the Size group, click the Dialog Box Launcher . On the Size tab, you can select options to size, rotate, or scale the chart. Right-click the chart that you want to save as a template, and then click Save as Template.